If you’ve been reading the news recently, it’s highly likely that you’ve heard a thing or two about bees. This has mainly been due to new findings that exhaust fumes have a significant effect on bees’ ability to find food. However, bees have been a hot topic for some time now and their plight has been brought to our attention in the press over the past 10 years. Bees are one of the world’s most important natural pollinators and contribute significantly to our crop production, offering a vital natural resource for the food industry. Consequently, the loss of bee colonies is undoubtedly a cause for concern. Many figures have been thrown around to try and give some significance to the problem of bee decline and it would be fair to say that we do not have an accurate idea about what the exact repercussions would be if bees were to become extinct. However, what we do know is that they offer a great service at no cost and the loss of them would almost certainly lead to a great increase in the cost of food production as well as the loss of many wildflowers. What is certain is that we cannot simply accept that they are a resource we could lose until we have a better idea of the contribution they give. Most of the factors putting the bee population under threat can be attributed to changes in the way we farm that have occurred throughout the 20th Century. These changes have led to a loss of flowers and increased use of pesticides; diseases and parasites have also contributed significantly. Dr Lynn Dicks is a Research Fellow at the University of Cambridge working on sustainable farming and conservation of wild insect pollinators. What’s the current scale of the problem? Please see my blog post on the subject. Would you mind talking through some of the main contributing factors to the problem? The first thing to say is that there are many different pressures on pollinators. A number of key factors seem to be responsible and it’s not clear how large their relative effects are or how they interact. To my mind the most important thing is changes to farming that happened some time ago now, which led to a dramatic loss of flowers in the wider countryside. What that does if you’re an insect that feeds on nectar is you lose your food and if you look at the current agricultural landscape there are far fewer flowers than there were say in 1950. The change came about through loss of hedgerows and large scale fertilisation (or improvement) of grassland. The other factor often talked about is the use of pesticides. In the 20th Century we moved from not using any synthetic chemicals in farming to using many different crop protection chemicals, including herbicides, insecticdes and fungides. We shouldn’t be surprised that insecticides have adverse effects on insects because that’s what they’re designed for. But now there’s evidence of sub lethal effects on insects such as bees, which benefit crops rather than harming them. However, the evidence linking these changes directly to observed losses in bee diversity, or declines in numbers of butterflies and moths is indirect. There is still a lot we don’t know about what limits pollinator populations. For example we know very little about problems with diseases, especially those affecting wild insects. The Varroa mite, that affects managed honey bees, seems to have had a devastating effect on honey bee colony health. Is pollination something we could do without insect pollinators like bees? Very few plants rely completely on insect pollination; they usually have some kind of back up. That’s because insect pollination is risky. One option is to breed plants that don’t rely on pollination, which is starting to come about. This creates its own problems because pollination is a way of cross-breeding, which creates genetic variability. Genetic variability is very important to the health of crops and in wild flowers. Anyway, there’s no technological fix that will allow wild flowers to do without pollination, and around 80% of wild plant species seem to depend on pollination to some extent. Then there’s hand pollination, which is wildly expensive, but sometimes happens. For example, glasshouse tomato growers used to have all their plants pollinated by hand-shaking the wires. Now they buy in bumblebee colonies, at a cost that is almost negligible in comparison to paying people to do the work. Growers report that pollination by bees is much better. Are there any other environmental problems that could occur if we see further decline of the bee? We haven’t got on top of how important the pollination service is to the wild flowers that we all value. We don’t really know what happens to wildflower populations as pollinators decline. Some wildflower landscapes are deeply important cultural features. Think bluebell woods, riverside meadows and sea lavender on our coasts. One of the things I found really interested from the article was how much of a percentage big business had over some of the crops. How receptive has big business been to the problem and how can we work with big business to address the issue of bee decline in the UK? Very receptive. 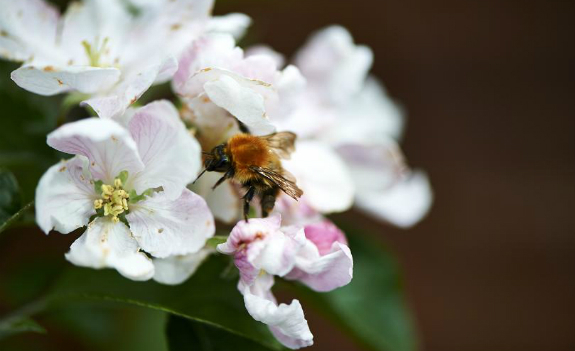 Businesses in food retail and the farming sector are acutely aware of the pollinators issue and other environmental issues. If you want to secure the future of food production, soil, water quality and of course pollination can have a big impact. Businesses that are economically reliant on pollinator-dependent crops are listening. This includes things such as coffee and surprisingly vanilla, which is completely dependent on pollinators because the flowers are ‘self-incompatible’ and cannot self-pollinate. Supermarkets know there’s a serious issue of risk and if you reduce pollination services the price of some foods go up because production falls. The same kinds of things happen if you continually degrade soils. People in retail and food production realise that you can’t continue to degrade soil and continue having reasonably priced food. What about your everyday consumer? Are there small things that they can do to help address the issue? There are lots of things that individuals can do. You can plant flowers that actually produce nectar and pollen in your garden and integrate them into landscaping plans in the city, which is something that’s not done often enough. In my mind there’s really no need for using pesticides and we know gardens are very important to wild pollinators. It tends to be better for them in gardens than the agricultural landscape. And if people are using pesticides in their gardens they should be aware that they’re having a direct impact on wild populations and possibly not do it. Amanda Williams is the founder of ‘Buzz About Bees’, a website aiming to raise awareness, as well as provide information about bees. Her twitter account was featured in the Guardian Eco Top 50 Wildlife & Conservation Accounts in 2010. What’s ‘Buzz About Bees’ and how did it start? BuzzAboutBees.net is a free information resource about bees, including honey bees, bumblebees and solitary bees. I began campaigning for bees about five years ago to raise awareness of the challenges they face, and noticed there was very little general ‘easy read’ information out there at that time. I wanted to provide lots of resources, from how to garden for bees, to information about the various life cycles and differences between species groups, plus the threats to bees and why we need to help them. 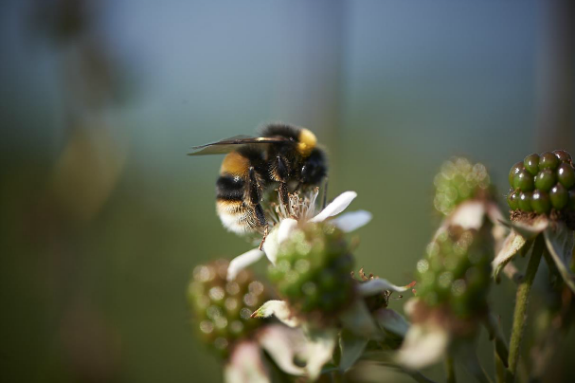 What are some of the common misconceptions about bees in the UK? That bees are aggressive, when in fact they rarely are. 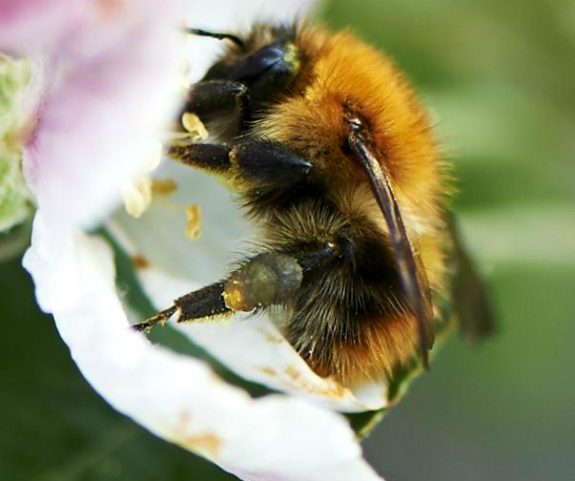 Bumblebees are generally very docile and so are solitary bees. Honey bees may sting if they are aggravated, but bees are not out to deliberately sting anyone. People don’t realise that bumblebee nests only last a season and that the colony will die naturally in a few weeks. I discourage the removal of bumblebee nests, because relocating them is rarely successful. Beekeepers may provide assistance with honey bees. When people think of bees, the image they have in their minds is the fluffy, striped bumblebee. However, bees are diverse in appearance and size. Some can be mistaken for wasps or black flies! That all bees make honey. Only honey bees make honey. That Varroa is a problem for all bee species and a major cause of bee decline. Varroa mite only affects honey bees. Why is it important that we protect bees? Precisely because they pollinate food crops directly and indirectly. Imagine our diets without raspberry jam, apple pie, beans, coffee and various nuts – the parts of our diets considered most enjoyable would become more expensive. Bees not only pollinate the food we eat directly, they also pollinate food eaten by livestock, such as the alfalfa fed to cows. It is estimated that bees pollinate about a third of the food we eat. In addition, it’s important for those of us who value the sight of flowers in our gardens, berries in autumn and for the birds and small mammals that feed upon them. Let’s not forget the wider role bees play in the great web of life. What are the main threats that bees in the UK are currently facing? Habitat loss is serious, simply because we have lost many habitats upon which species depend. Intensive farming has resulted in the loss of many wildflower meadows. The Grasslands Trust estimated that by 1989, about 97% of traditionally managed lowland meadows disappeared. Hedgerows have been lost, and with them, an important source of food, nectar and nesting sites. We have also lost wildflower landscapes and hedgerows to building development. A further threat is pesticides, and in particular, the neonicotinoid insecticides are of particular concern because they remain in the soil for years, thus having the potential to accumulate. They are also mobile in soil, surface and ground water, and this means they have the ability to trespass beyond treated zones, and contaminate hedgerows and pollinator margins around fields. Making changes to your garden is an easy way for many people to help. 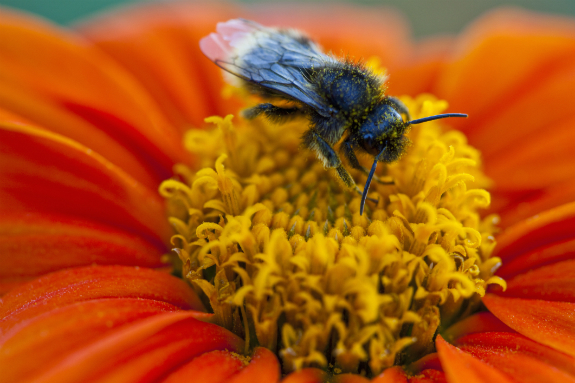 How can people make their gardens ‘bee friendly’? Great question, because gardeners can help a lot! Right now, gardeners are tidying up their gardens. Remember that some bees may be hibernating in the hollow stems of plants. If you need to tidy them away, cut the stems and leave them in a pile at the back of the garden – or better still, leave them until next spring. If you are planning your garden for the coming year, please think about the bees. For instance, if you are planting bulbs, include crocus, daffodils, bluebells and snow drops. Try to provide food for bees through the seasons. Include wildflowers in your border if you can (I recommend purple loosestrife, vetches, bird’s foot trefoil) and leave a patch of clover to flourish in your lawn – the scent is beautiful! Many herbs and cottage garden flowers are great for bees. Even a container or hanging basket could be filled with bee-friendly plants. Include a solitary bee box in your garden – or make one from hollow canes. Place it on a sunny wall or fence. Please avoid pesticides. Most insect species are actually beneficial or harmless! What are some other ways in which people can help? Ask your local council to play their part, by not mowing wildflower roadside verges and cutting back hedgerows unnecessarily. Encourage your friends and neighbours to do the same. Ask councils not to spray pesticides. Ask your local golf club not to use neonicotinoid insecticides on the golf course. Enthuse the next generation, so that they too are keen to protect bees and other wildlife for the future. Share your bee-friendly plants with neighbours if you are able to. If you are able to take part in, and support any campaigns to help bees, then why not do so? Public pressure is important in creating positive change. Where else can people look to find out more about the issues facing bees? I recommend my own website www.buzzaboutbees.net for this and all kinds of other bee-related information!